AS ONE PUSHES THROUGH the layers of quaint old buildings and high-rise apartments, there is an old world that surfaces each year in Bengaluru. And, the Karaga Jaatre that takes place in the heart of the old city is testimony to that memory, which springs from the remembered cultural history of a bygone era. For 11 days, from saptami (seventh day) until the full moon rises in the Hindu month of Chaitra, the lanes swell with hordes of people, some of whom share a known history and many who come to revisit the cultural past where mythical tales, traditions and rituals from a rich rural history are woven into urban history. Karaga Jaatre begins at the Dharmarayaswamy temple, located in Thigalarpet. It is one of the rare temples dedicated to the memory of the Pandavas. Legends state that as the Pandavas waited for the celestial chariot to take them on their last journey, Draupadi was the last to ascend, and, in that moment, a wicked asura, Timarasura, accosted her. An enraged Draupadi transformed into her primordial goddess form of Adi Shakti, creating veerakumaras (warriors) from various parts of her very being. Timarasura, however, was protected by a boon—a thousand Timarasuras would regenerate out of a single drop of blood that fell on the ground! Adi Shakti, therefore, prevented the spillage of blood by licking every drop and finally swallowing him whole. She then assumed the form of Draupadi to ascend to heaven, but with the promise of returning once a year during the first moon of the first month. It is believed that she left behind her energy in a mud pot, the karaga. And, it is this pot made of unbaked clay—called hasi karaga—with secret contents inside that takes centrestage during the Karaga Jaatre. The karaga is carried by the priest of the Thigala community, said to be descendants of veerakumaras. The Thigala community, originally gardeners from Arcot district of Tamil Nadu, reportedly moved to Bengaluru to lay out the Lal Bagh on the invitation of Mysore ruler Hyder Ali. During the festival, veerakumaras, dressed in white pyjamas or dhotis with a red waistband and a gold turban, safeguard the karaga. Wearing a kankana (sacred yellow thread entwined with a turmeric root, tied to the wrist)—a reminder of their ritual purity (abstinence)—and wielding a sword, veerakumaras proclaim their allegiance to the goddess. A floral (jasmine) pyramid rests on the karaga, which is balanced on the priest’s head. Donning a yellow sari, he wears the mangalsutra and bangles of his wife, who remains a ‘widow’ until the rituals end. The priest dons the female garb to absorb feminine energy. The festival begins with the dwaja aarohana (flag hoisting), followed by the tying of the kankana and offering of prayers. For the next six days, evening aarti takes place at the shakti peetam (goddess’s shrine) and along extinct tanks (manmade lakes), existing lakes and nearby wells. On the seventh day, the priest takes a ritualistic bath in the Sampangi tank, amid shouts of ‘Govinda’ and a shower of flowers, and enters the temple with the karaga. On the eight day, the wives of veerakumaras make an offering to the goddess. On the ninth night, the wedding of the goddess takes place, and the priest leads the procession, carrying the hasi karaga, as the Chaitra moon looks on. The festivities commence after midnight, drawing huge crowds. There is a spiritual fervour, as the karaga visits the homes of veerakumaras and the priest performs pujas. 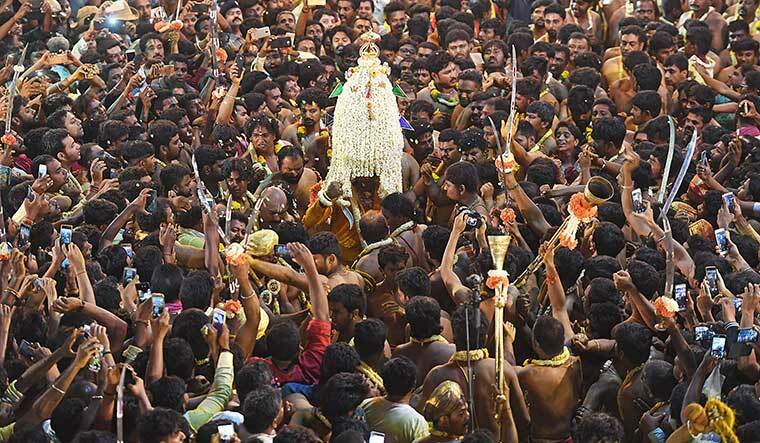 As per legends, in the unfortunate event of the priest being unable to balance the karaga on his head during the procession, the veerakumaras have the power to behead the karaga-carrier. Thankfully, no heads have been lost so far. About carrying the karaga, M. Abhimanyu, who was the pradhana archaka at the temple from 1994 to 2005, said, “It is a great honour for us as well as a blessing of the highest order.” Manu Nagaraj, who trained under Abhimanyu, is the present pradhana archaka. The priest also receives aartis from nearby temples, and visits the Hazrat Tawakkal Mastan Saheb Dargah in Cottonpet. Here, the alaguseve [offering/service with the sword] is performed, and Muslims, too, join in the prayers. By the time the karaga-carrier returns to the temple, it is dawn. The hasi karaga is finally kept at the altar. On the tenth day, a shanti puja is offered to the Potharaja (brother-in-law of the Pandavas). And, Karaga Jaatre ends with the dwaja avarohana (flag lowering). “It [Karaga Jaatre] is a process where the priest and the pot become a conjoint entity and together they become the karaga,” states Smriti Srinivas in Landscapes of Urban Memory: The Sacred And The Civic In India’s High-tech City. The Karaga Jaatre thus is a telling story of a strong connect between the carrier and the auspicious pot, where the body and soul become one, purifying the actors and audience alike in the act of participation in the rural-urban milieu. A former lecturer of political science at Mount Carmel College, Bengaluru, Iyer is the Chennai-based author of Soulscapes: Travels and Conversations in India.